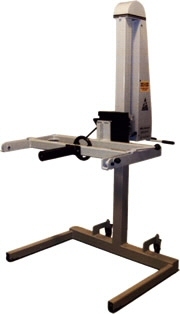 The EZ-Tilt 600 Large Roll Tilt System, is a simple, inexpensive and effortless solution for lifting, tilting, and transporting large and heavy roll products weighing up to 600 pounds. 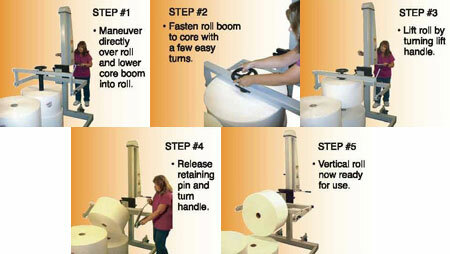 Simply lower the 3 inch Diameter Core boom into the roll core, lock into place, lift and tilt. Conversely, rolls are just as easily stored in horizontal position by reversing the procedure. The E-Z Tilt with its robust all-steel construction and fully mechanical design is an invaluable product that will provide your company years of safe and dependable service. 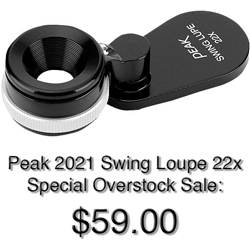 Approximate 70" clearance with core boom vertical. Weight capacity (lbs.) = 600 lbs.